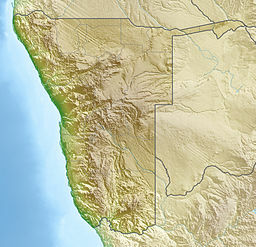 Aurus is a Mountain at the eastern border of the Diamond Restrited Area also called Sperrgebiet, in the southwestern part of Namibia. It reaches a height of 1,050 m. Its expansion is about 5 km × 4 km. The meteor crater Roter Kamm is located in a distance of 12 km south-southwest of Aurus. The crater can also be seen well on satellite images. 35 and 55 km southeast of the Aurus Mountain zinc is mined in both the Skorpion- and the Rosh Pinah mine. This page was last edited on 30 June 2018, at 11:29 (UTC).